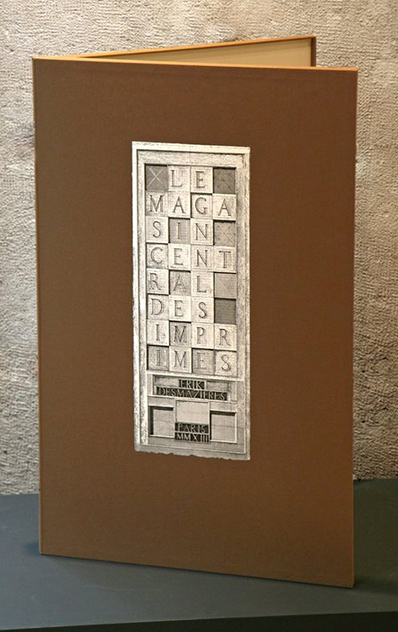 After three years of work, Erik Desmazières has completed one of his most ambitious projects, a portfolio of prints titled "le Magasin central des imprimés". 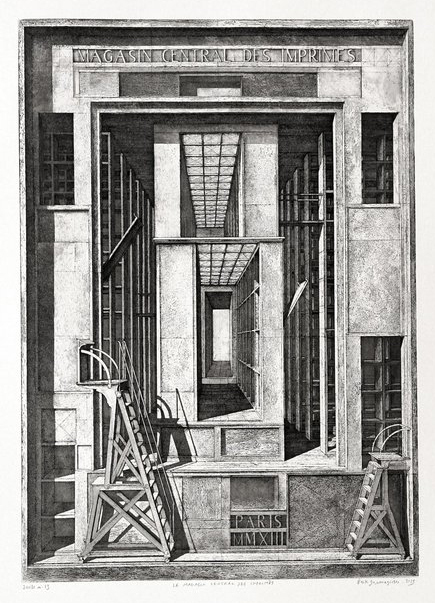 Comprised of 6 etchings, in a portfolio with frontis piece, Desmazieres delivers an exceptional vision of the Bibliothèque Nationale de France (BnF) as it was redesigned by the architect Henri Labrouste in the 19th century. 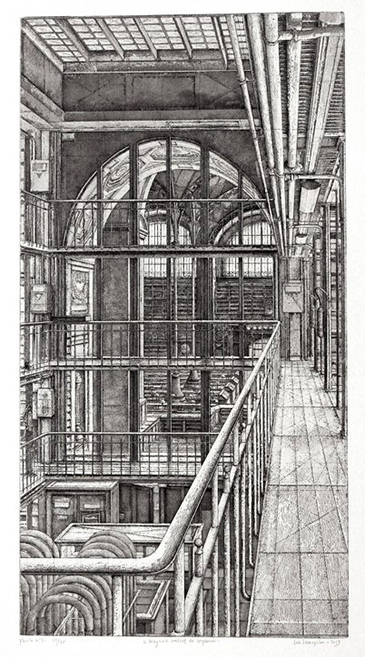 Erik Desmazières has long been inspired by libraries, be they real or imaginary. Also attracted by architecture, the artist could only be fascinated by the National Library, expanded and renovated by Henri Labrouste under the second Empire. With this new portfolio Erik Desmazières has now turned his attention to depicting scenes in the central storage areas for printed matter, the hidden part of the library. 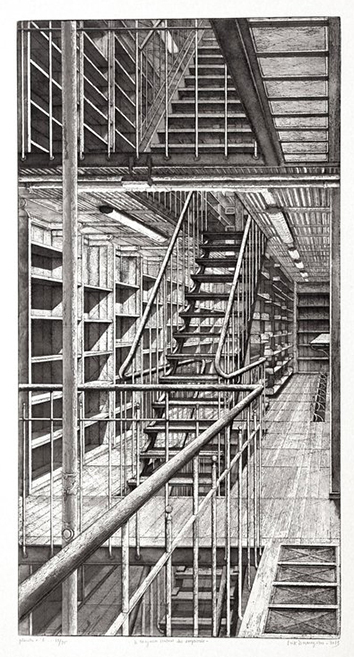 Desmazières allows us to enter the belly of the library, a metal lair, to capture the mystery of this huge reserve of books — before the building is redeveloped as part of the renovation of the Richelieu site. The border between reality and imagination tends to fade in the work of Desmazières. 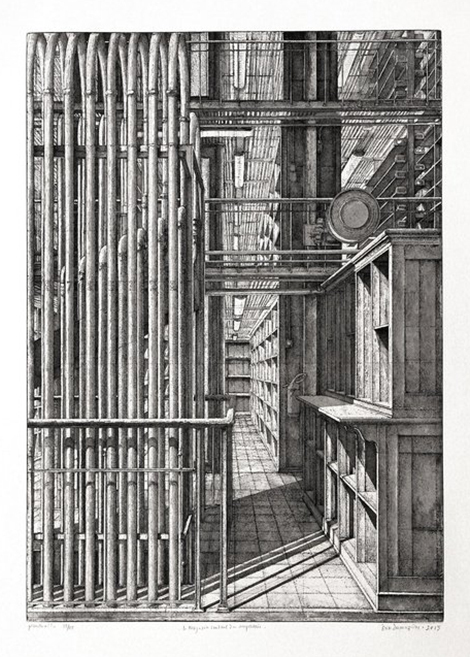 His carefully constructed imagery exceeds the simple transcription of reality, following a path similar to other great visionary artists such as Piranesi and Meryon. This series follows an initial group of prints completed in 2001 on the reading rooms of the BnF. The relationship between the artist and the BnF continued with the illustrations for a text by Olivier Rolin on the Coronelli Globes, published on the occasion of their restoration and their installation at the François-Mitterrand site in 2005.